Computer Science for Fun - cs4fn: Download our computer science magic books! Download our computer science magic books! The cs4fn magic books are collections of easy to do magic tricks (mainly simple card tricks). The twist is that every trick comes with a link to some computer science too. That means that as you learn the tricks, you will learn something about what computer scientists get up to too. Magic is a combination of a secret method and a presentation. A computer scientist would call the method an algorithm, and that is all a computer program is too. The presentation corresponds to the interaction design of a program. For a magic trick to delight, you must get both the algorithm and presentation right. The same is true for programs. These books are created to introduce you to the wonderful world of computer science via the equally wonderful world of magic. Each book contains a suggestion for further reading if you are interested in finding out more about magic as a hobby, and more about the talented magicians past and present who created both mathematical self working and slight of hand techniques. There are also loads of hobby magic teaching sites on the web, and by summoning the magic of a search engine you can explore and learn. As a hobby magic is fantastic fun, and we think its a great way to learn about algorithms and human behaviour too. Just remember to always practice, perform and most of all entertain. Top computer games designer and recent astronaut, Richard Garriott, loved the first book. He even tried his hand at some magic tricks in space on his recent visit to the International Space Station as a private astronaut. 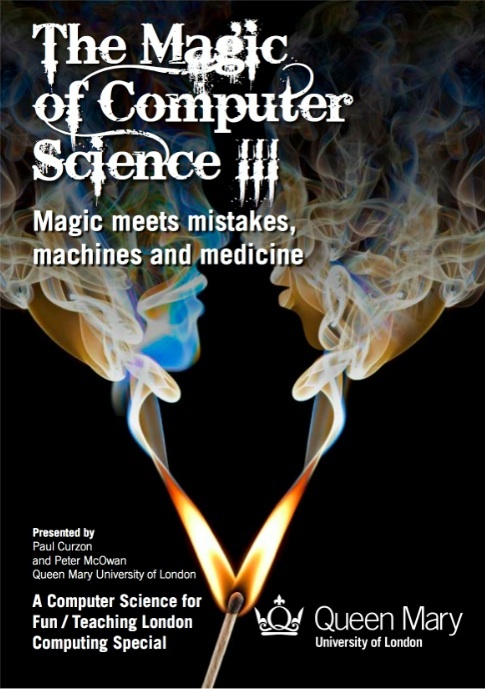 Did you know computers can also help magicians create new magic tricks? You can also read about all the tricks (and more) online. Just browse the links below. Watch out for our new tricks. So impress your friends with your powers of illusion. Just make sure you keep the secrets!